Analysis: The 2015 fifth-rounder caught 30 passes for 423 yards and two TDs for the Steelers in 2018. 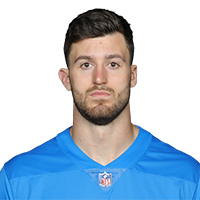 James will now slot in as the Lions' top pass-catching tight end, an assignment that should lead to a degree of fantasy relevance for the 6-foot-7, 261-pounder this coming season. 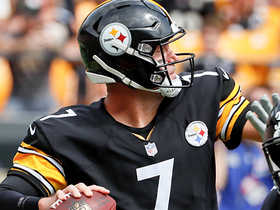 Analysis: For the second straight game, Ben Roethlisberger failed to throw a pass to James, whose playing time dwindled as the season progressed. He finishes 2018 with 30 catches (on 39 targets) for 423 yards and two touchdowns in 16 games and is a clear second choice at tight end behind Vance McDonald. James is an unrestricted free agent worth keeping an eye on this offseason. Analysis: The fourth-year tight end's disappointing season continued against the Saints, and James didn't see any targets after the seven-minute mark of the first quarter. He hasn't been a factor on offense for several weeks and faces New Orleans -- who allows the third fewest fantasy points per game to tight ends (4.9) -- in Week 16. James caught one of three targets for seven yards during Sunday's 33-30 loss to the Chargers. Analysis: With Vance McDonald no longer hampered by a hip injury, James returned to his backup role against Los Angeles. He is on pace for 36 receptions on 46 targets, both of which would be his lowest totals since his rookie campaign in 2015. Still, he has an attractive Week 14 matchup against an Oakland defense that allows the league's worst catch percentage (78.2) against tight ends. James caught all four of his targets for 35 yards during Sunday's 24-17 loss to Denver. 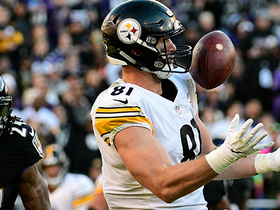 Analysis: After failing to be targeted in Week 12 -- the first time all season -- James saw his highest looks total from Ben Roethlisberger since Week 6. Three of those passes came after Vance McDonald (hip) left the game in the third quarter, although he did return. Even if the hip injury prevents McDonald from playing in Week 13, James has an unfavorable matchup against the Chargers, who allow tight ends to score just 6.4 fantasy points per game this season. James was not targeted during Sunday's 20-16 win over the Jaguars. Analysis: James' slide hit rock-bottom Sunday for his first catchless performance of the season. After being targeted five times in each of the Steelers' first two games, the Penn State product has been targeted more than three times just once in his past eight games as starter Vance McDonald heats up. Sunday brings a Denver defense that ranks near the middle in fantasy production allowed to this position. James caught his lone target for an eight-yard touchdown during Thursday's 52-21 win over Carolina. 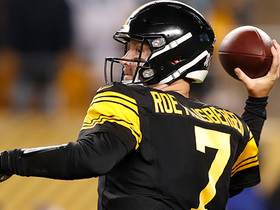 Analysis: Considering Ben Roethlisberger completed 22 of 25 passes for 328 yard and five touchdowns, this was a disappointing night for James. Vance McDonald continues to outproduce him and that is likely to be the case when Pittsburgh faces Jacksonville in Week 11. James caught two of three targets for 53 yards during Sunday's 23-16 win over Baltimore. Analysis: Despite having just two receptions, James produced his highest yardage total since Week 2. He seems to rank behind Vance McDonald on the depth chart but has an attractive Week 10 slate on Thursday against a Carolina defense that allows the most fantasy points per game to opposing tight ends. James caught two of his three targets for nine yards during Sunday's 33-18 win over Cleveland. Analysis: After totaling 198 receiving yards and a score in the first two games this season James has managed a meager 85 yards over the next five with no touchdowns. Fantasy owners should look elsewhere to fill their tight end lineup spot, especially in Week 9 against a Baltimore pass defense that has allowed just two touchdowns to tight ends this season, although both scores have come in the past two games. James had five receptions for 26 yards during Sunday's 28-21 win over Cincinnati. Analysis: His seven targets were the most in a game this season and is averaging 16.1 yards per catch after averaging no better than 8.7 YPC in any of his previous seasons. Following a Week 7 bye, James will face a tough Cleveland defense that has held opposing tight ends to an average of three catches for 29 yards and no touchdowns in five out of six games this season. Keep in mind, however, that the Browns have faced several teams who don't actively seek out the position on offense. James caught both his targets for 20 yards during Sunday's 41-17 win over the Falcons. Analysis: James has only been targeted four times over the past three weeks after seeing 10 targets in his first two games of the season. Week 6 may result in more of the same against a Bengals defense that limited him to one catch for 13 yards the last time they met. James caught his only target for 23 yards during Sunday's 26-14 loss to the Ravens. 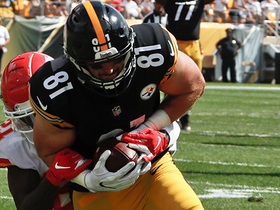 Analysis: Vance McDonald has emerged as the lead tight end the past two weeks, limiting James to one target in both contests after seeing 10 in the first two games. Regardless, James has a difficult Week 5 matchup against Atlanta, which has held opposing tight ends to an average of 49 yards on five catches through four games, with just one touchdown. James caught his lone target for seven yards in Monday's 30-27 win over the Buccaneers. Analysis: Its been feast or famine for James in the early going this season, and fantasy owners who inserted him in their lineup had to be disappointed following his 5-138-1 stat line in Week 2. Further frustrating fantasy owners, they had to watch as Vance McDonald grabbed four passes for 112 yards and a touchdown. It remains to be seen how Pittsburgh intends to use these two talented tight ends moving forward, making it difficult to start either unless one emerges. James caught all five of his targets for 138 yards and a touchdown during Sunday's 42-37 loss to Kansas City. 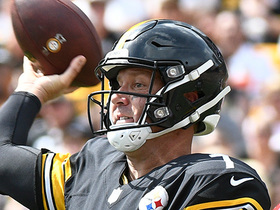 Analysis: With Pittsburgh down three scores early, Ben Roethlisberger scrambled around and lofted a 26-yard pass to James for the Steelers' first score of the game. James has been getting down field thus far this season. Be aware: depth charts can be misleading. James, the No. 2 tight end for the Steelers, has 198 receiving yards to Vance McDonald's 26. James totaled 60 yards while catching three of five targets during Sunday's 21-21 tie with the Browns. James will be the Steelers' starting tight end Sunday in Cleveland, Jeremy Fowler of ESPN.com reports. Analysis: James was in line for a larger workload Week 1 with Vance McDonald (foot) on the mend, and the latter subsequently was ruled out. As a result, James will be the tight end of choice in a Steelers offense that may be without Le'Veon Bell (contract dispute) in the season opener. Even if there are more targets up for grabs, James has surpassed 50 yard receiving just two times in 40 career games. James (back contusion) isn't listed on the Steelers' initial injury report ahead of Sunday's game against the Browns, Scott Petrak of the Elyria Chronicle-Telegram reports. James suffered a back contusion during Saturday's preseason game against Tennessee, ESPN.com's Jeremy Fowler reports. James brought in one of two targets for 21 yards in the Steelers' 51-34 preseason loss to the Packers on Thursday. James, who caught both his targets for nine yards in Sunday's 28-24 win over the Browns, finishes up the 2017 season with 43 receptions (on 63 targets) for 372 yards and three touchdowns playing in all 16 games. Analysis: James came out of the gate strong, scoring two touchdowns on six catches in Week 1, but only managed to score or have more receptions just once more all season. 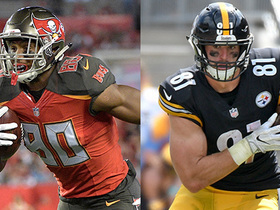 The tight end position has taken a backseat role in Pittsburgh's juggernaut offense, and James will likely still be in a timeshare with Vance McDonald, limiting the fantasy value of both next season. James caught two passes for seven yards in Pittsburgh's 27-24 loss to New England on Sunday. Analysis: Despite Vance McDonald (shoulder) being inactive, James was unable to get much going with his five targets, including what appeared to be a game-winning 10-yard touchdown with 28 seconds to play. Unfortunately, the play was overturned on review, with official Tony Corrente saying the ball did not "survive" the completion of the catch. Fantasy owners still alive in their playoffs should look elsewhere for a tight end in Week 16. James could see his offensive snap share increase in Sunday's game against the Patriots with Vance McDonald (shoulder) ruled out for the contest. James caught 10-of-12 targets for 97 yards in Pittsburgh's 39-38 win over Baltimore on Sunday. Analysis: James had the best game of his career, exceeding his previous bests in receptions (6) and yards (49), although he failed to score for a fourth straight game. With just three touchdowns this season, and just one since Week 1, it is hard to justify starting James in fantasy playoffs against a Patriot defense that had kept opposing tight ends out of the end zone for the past six games. James caught three passes for 32 yards in Pittsburgh's 31-28 win over Green Bay Sunday night. James brought in five of eight targets for 21 yards and a touchdown in Thursday's 40-17 win over the Titans. James' teammate, Vance McDonald (ankle), is inactive for Thursday night's game against the Titans. Analysis: James' production has been spotty of late, but with McDonald out Thursday, James and Xavier Grimble could see added opportunities in the Steelers offense. James is still a Week 11 fantasy dart, but he is an option for those in deep leagues scrambling for tight end help this week due to byes and/or injuries. James failed to secure either of his two targets in Pittsburgh's 20-17 win over Indianapolis Sunday. Analysis: This is the third time in his last four games that James has gone without a catch, as he and Vance McDonald continue to split tight end duties. Neither is seeing enough action to warrant fantasy consideration at this time. 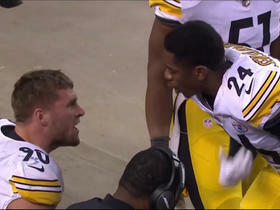 Pittsburgh Steelers cornerback Coty Sensabaugh and linebacker T.J. Watt are at odds on the sideline. The "NFL Fantasy Live" crew highlights the players who stood out in the Week 10 matchup between the Carolina Panthers and Pittsburgh Steelers. Pittsburgh Steelers tight end Jesse James cuts to the outside for an 8-yard catch-and-run touchdown. Pittsburgh Steelers tight end Jesse James hauls in bobbling catch for 51 yards. 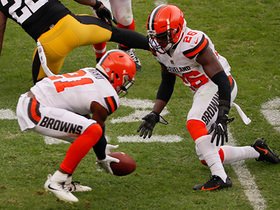 Pittsburgh Steelers running back Stevan Ridley fumbles the ball while Cleveland Browns defensive back Denzel Ward recovers for the Cleveland Browns. NFL Media's Senior Fantasy Analyst Michael Fabiano gives his tight ends to stream in Week 3. 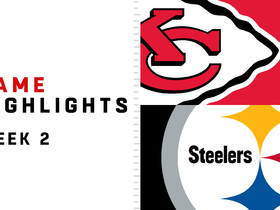 Watch the Kansas City Chiefs vs. Pittsburgh Steelers highlights from Week 2 of 2018. Pittsburgh Steelers quarterback Ben Roethlisberger scrambles, finds Jesse James down sideline for 46 yards. Big Ben stands strong in pocket, connects with Jesse James in stride for 32 yards. Pittsburgh Steelera quarterback Ben Roethlisberger lofts 26-yard touchdown pass to tight end Jesse James.